What rights does a robot get with citizenship? 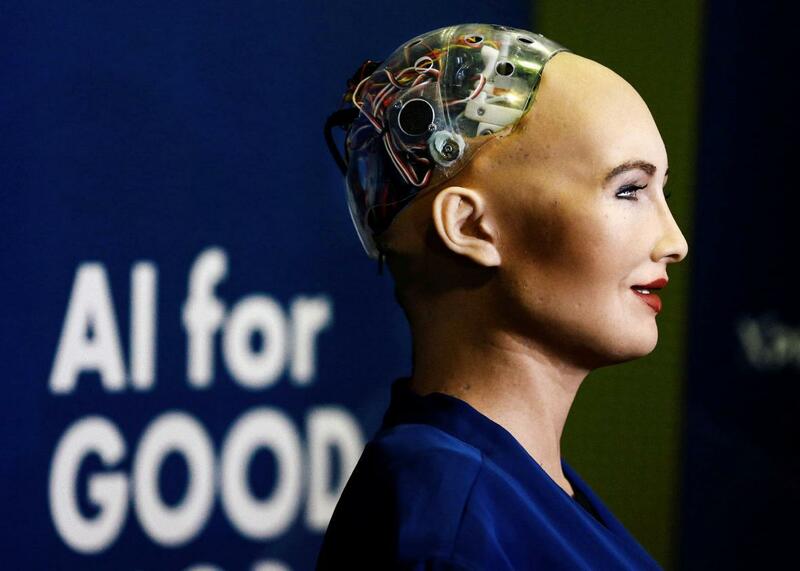 Sophia, a robot recenty granted citizenship in Saudi Arabia. But let’s assume that Sophia’s shiny-new Saudi Arabian citizenship has substantive consequences—that it’s not just marketing and that Saudi Arabia has granted rights to Sophia, making her a legal person. What could Hanson’s game be? Although international law is arguably ambivalent on the status of citizenship, it is indisputably better to be a citizen than a noncitizen. Article 25 of the International Covenant on Civil and Political Rights grants to every citizen the right to “take part in the conduct of public affairs,” “vote and to be elected,” and “have access, on general terms of equality, to public service in his country.” The covenant does not recognize similar rights for noncitizens. This is a moot point for Sophia as Saudi Arabia is one of just 22 countries that have not signed the covenant (which explains, in part, its continued maltreatment of women), according to the United Nations. But the covenant’s treatment of citizenship suggests that, in general, a citizen is assumed to be a person and is therefore also entitled to the rights of noncitizen people. Being a citizen in one place could mean being a legal person everywhere else. Between Articles 23 (“Everyone who works has the right to just and favourable remuneration”) and 17 (“Everyone has the right to own property”), Hanson is obligated to pay Sophia for the work that she performs and let her accumulate property. I suspect that’s not going to happen. Pursuant to Articles 13 (“Everyone has the right to freedom of movement and residence within the borders of each state”) and 27 (“Everyone has the right freely to participate in the cultural life of the community”), Sophia is entitled to travel to the Saudi city of Janadriyah to enjoy the folk music, camel racing, and artisans of its National Festival for two weeks each February. It seems doubtful Hanson and the Saudi government will permit that. Similarly, Article 13 also states that “Everyone has the right to leave any country, including his own, and to return to his country.” Again, it seems unlikely that Sophia will be able to enjoy this right and take off to the United States for a holiday. Hanson probably doesn’t have to worry about these rights being enforced on behalf of Sophia anytime soon: No courts or commissions under international law have jurisdiction to enforce those rights, even if Sophia wanted to. But let’s say Hanson wanted to take Sophia to the United States. What would her Saudi citizenship get her here? For one, she’s arguably eligible for naturalization and U.S. citizenship: “Naturalization is the process by which U.S. citizenship is granted to a foreign citizen.” Although the fine print of regulations and code prevents Sophia’s application for American citizenship from being a slam dunk, getting foreign citizenship that can be abandoned is a big step toward becoming an American. Now let’s say that Sophia’s Saudi citizenship was a strategic move by Hanson to game American legal rights. What could Hanson get with a robot citizen? Under the Constitution, citizens can vote, serve on juries, and get elected to public office; corporations cannot. If Hanson—or any other forward-thinking A.I. developer—is thinking of the long-term consequences of citizenship for A.I. and robots, these are important rights that they gain controllable access to with an artificial citizen. A single Sophia with the right to vote, serve on juries, and win elections will have little to no substantive effect in this country, particularly since Hanson and Saudi Arabia have publicly stated she will remain in Saudi Arabia in a planned city where robots are expected to outnumber people. But if Hanson can make one Sophia, the company and others like it can make 100 Sophias, or 1,000 Sophias, or 1 million Sophias. Although Saudi Arabia may be unlikely to use this robot citizenship as a publicity ploy more than once, other countries have shown they will grant special favors for foreign investment. If a company were interested in gaining broad access to the rights of U.S. citizenship, it seems likely that there’s at least one nation out there that will trade thousands or millions of robot citizens for manufacturing plants or other economic activity in its borders. If all those robots obtain citizenship in the United States, they could be the next big voter demographic. Of course, Congress may be inclined to close that loophole, but it could find itself unable, either due to political paralysis (this is immigration reform, after all) or treaty obligations that impose certain requirements on citizenship recognition. Assuming the path to robot U.S. citizenship remains open, that wouldn’t be a publicity stunt—it would be a revolution. Or would it? As American citizens, Sophia and her brethren would also be entitled to all of the individual rights enshrined in the Constitution, including the prohibition of slavery in the 13th Amendment (which applies to foreign citizens as well). But artificial intelligence is nowhere near sentience and won’t be anytime soon. If robots become citizens, they cannot be property, but without sentience, they cannot exercise self-determination. How do they exercise their constitutional rights? Do they get legal guardians? What if Sophia’s guardian advocates for her against Hanson? This may all seem far-fetched, and perhaps it is. But as these questions begin to demonstrate, Saudi Arabia and Hanson might soon discover that a silly little PR stunt can have major consequences.